1. 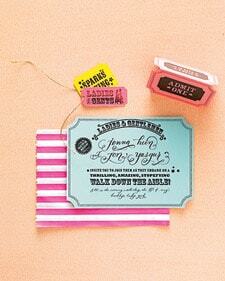 These simple and effective ticket style invitations would be great for film themed wedding. 2. These Rustic themed wedding invitations are fully customizable. All you have to do is choose your colours and enter your details, the invite is automatically created for you ready to print. 4. Here is a free and editable ‘save the date’ from Ruby and Willow, isn’t it sweet? 5. I love the versatile colour of this stationery, colour can be added with the punched hearts and twine which are also available from the designers shop. All you have to do is click here and scroll to the bottom where you will find the download instructions and away you go. 6. We love this elegant custom monogram style stationery. It is available in an array of colours which is great if you have a certain colour scheme you would like to stick to. If you want the full bells and whistles you can create your own design and ask for it to be letter pressed on cotton or bamboo paper or you can just print on your paper at home. 7. How cute are these illustrated invites, there is something very personal about seeing an invite that is or at least looks handwritten your guest will be blown away with the sentiment. 8. This ticket wedding invitation is a little more complicated than the others but well worth it if you want some unusual style invites. First you will need to download their clipart to make your own rubber stamp and you will need to have some fancy handwriting, but from here its all printing on card, simples! 9. Here is another monogram style invitation for you only this one is full of pretty florals. This would be great for a country garden wedding, don’t you think? 10. This is another pretty floral invite perfect for spring and summer and super easy to download and use. 11. This Tandem bicycle design is a fantastic collection. Complete with templates for response cards and other stationery so that you can carry the theme throughout your wedding. 12. Another save the date, this ‘words’ template is another simple yet effective design. If you wanted to have the same theme throughout all of your stationery you can create your own invitations by downloading the fonts for free from dafont.com. 13. This set of Bird and Blossoms invites would be perfect for wildlife lovers. Available on Budget Savvy bride, and complete with step by step instructions on how to create, these invitations couldn’t be any more simple to make. 14. This Blue Birds printable invitation has to be one of my favourite, I love how artistic it is! 15. These free pocket fold invitations are great with such bright and eccentric colours. The download also includes RSVP cards and enclosure cards all you will need to do is buy the pocket folds which will definitely help cut the costs of your wedding stationery. 16. If you were inspired by our ‘Pretty Paris’ inspiration board last week then you will need these Paris inspired downloadable invites. How cute!! 17. Sorry about all the bird invites but I cannot get enough of them they are the symbol of love after all (Oh god I sound like a complete sap!). This ‘Love Birds’ invite is so damn sweet! 18. Love the ombre effect in these invitations and the kit even has matching favor cards. 19. Save the Date bookmarks are so useful and handy! There are three designs to choose from Paris travel themed, elegant & classic with typography and lastly fun & funky design with some bunting. 20. This last invite is a real freebie, Boarding Pass invitations are such a good idea. This kit is complete with boarding pass invite, RSVP and envelope. Perfect for destination weddings or couples with a love of travelling. Hopefully there is something here for everyone. We would love to hear from anyone that will be using or has used any of these printables. If you have suggestions of other printables we would also love to hear from you. We love to share here in blogland. thanks for including our boarding pass invitation, we are so happy so many people like it 🙂 we will publish more freebies and DIY in the future. why are the ombre effect card not working? Great post Emily!! What a beautiful collection of stunning wedding invitations. It’s very difficult for me to choose the best one among all the invitations. These Wedding cards are really amazing. I recently designed these that I call “Wedding Invitation Card – Volume 01” that perhaps may be interesting to the audience. Does anyone know where I can find out more about the invitation suite that goes along with the Wedding Chicks formal crest? It is perfect for our wedding, but I can’t find anything. Thanks! What else was it you wanted to know, I may be able to help you? If you click that link it should take you straight to the printable? I also noticed that it’s just the monogram on the link. I would LOVE the invitations and RSVP cards as well but can’t seem to find them. It is just the monogram that is available for download, however this can be used on all wedding stationery. Please click on the link and it will automatically take you to the download. Thank you so much for including our printables in your post! 🙂 Hope they are helpful to your readers! Thank you Jessica! Our readers have been loving this post! Thank you so much for posting this! I’m so happy knowing I can do an affordable wedding with all these DIY projects I keep finding and save money for our future home. The pleasure is all ours Lauren, we are glad that we are able to help! Good luck with your Wedding planning!!! Thanks so much for these great DIY invites. I am having difficulty saving the edited files for the ‘save the date’ cards. Any ideas? I love love love the ombre ones but the link takes me to the lovebirds one – help! Hi Lisa! That link should now be fixed for you. If you would like to try again? Can you let us know which printable you need help with? Thanks for your generous help. I used your invitation card template & its free! really helps! You will need to contact the owner of the blog who offers the printables to see if they can help you? i love the monogram floral style that says it would be great for a country style wedding but the link doesn’t take me to the printable. can you please send it to me for the save the date, RSVP & invitation? love it! Please take a look at this link: https://guide.weddingchicks.com/15_invitation-suites.html you should be able to find your free printable there.